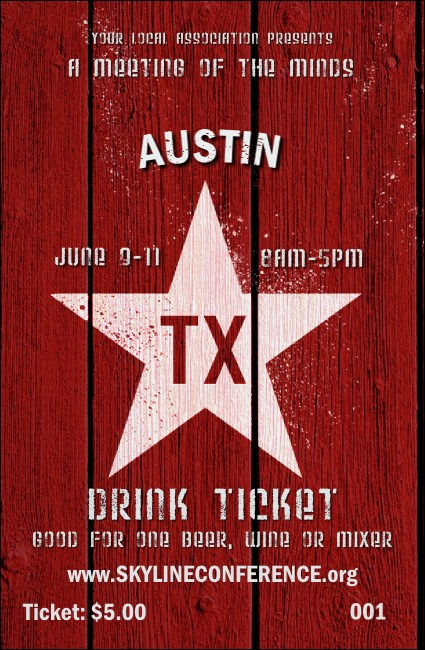 Let your guests sip their way to happiness in Bat City when you give them Austin Star Drink Tickets for your next Central Texas event. Keep your bar sales rolling in Silicon Hills with tickets that feature a bold red, wooden background design with a white star in the center and sequential numbering for easy event security. Find the right ticket and stand up to Texas heat at TicketPrinting.com.